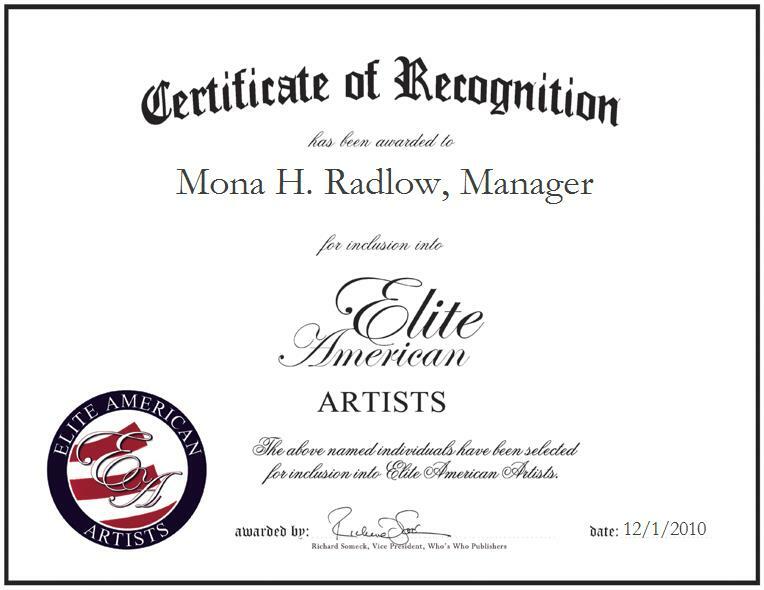 Brooklyn, New York | December 1, 2010 | Mona H. Radlow, Manager at Estrellanueva, has been recognized by Elite American Artists for demonstrating perseverance, guidance, and brilliance in all aspects of music production. With 20 years of professional experience, Ms. Radlow specializes in desktop publishing. She takes responsibility in producing CDs, overseeing sales, collaborating with disc makers and Legal Zoom to obtain the copyright of the company, updating the website, distributing business cards and playing the drums. She attributes her success to her drive and determination. Ms. Radlow completed college coursework and attained a certification in medical transcription. In her spare time, she volunteers for Veterans of Foreign Wars of the United States, Disabled American Veterans and St. Jude Children’s Research Hospital. In the future, she would like to see Estrellanueva, LLC grow into a successful firm by bringing other music groups into the mix. She also aspires to land a major record deal and eventually start her own label. For more information about Estrellanueva, visit http://www.estrellanueva.com.